Staff Selection Commission SSC is scheduled to conduct CHSL Tier 1 examination from 4th to 26th March 2018. A huge number of candidates who are looking for the jobs applied for the exam. Candidates who had applied are searching for the SSC CHSL Tier 1 admit card 2018 as it is the crucial document to carry for the exam and contains details regarding exam venue, roll number etc. SSC is going to release CHSL LDC DEO 10+2 admit card for all the regions from 3rd week of Feb 2018. Candidates can download SSC CHSL admit card 2018 from the direct link provided below. Staff Selection Commission (SSC) is an organization under Government of India to recruit staff for various posts in the various Ministries and Departments of the Government of India and in Subordinate Offices. SSC conducts various recruitment examinations for filling up the vacancies in various departments. It conducts CHSL, CGL, CPO examinations every year. This year it has released notification for the CHSL posts can download admit card from the official website. SSC released notification and invited online application for the recruitment of LDC DEO posts through CHSL exam. A huge number of eligible and interested candidates applied for the exam. Last time 30,57,993 candidates had applied for the exam. Overall 3259 vacancies are there which include 898 for Lower Division Clerk / Junior Secretariat Assistant, 2359 for Postal Assistant/Sorting, and 2 for Date Entry Operator. 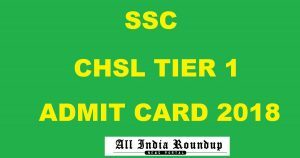 Candidates who had applied can download SSC CHSL Tier 1 hall ticket 2018 for all the regions soon. Click on SSC CHSL Tier 1 admit card. Stay tuned to this website. We will update SSC CHSL Tier 1 answer key, results here. Press CTRL+D to bookmark this page for easy navigation.